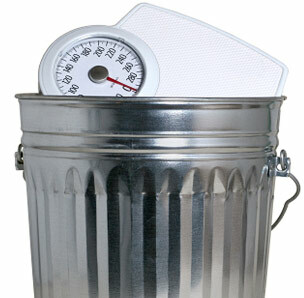 When you’re trying to get fit, throw away the scale! This was my immediate reaction when I was first told this by a fitness guru friend. As someone who is obsessed with and motivated by measuring my performance against objectives, the idea of throwing out the scale when I’m trying to achieve certain fitness goals is like driving blind-folded. Fat and muscle weigh approximately the same; however muscle takes up less space. So it’s not uncommon for your weight to plateau or stay much the same as you begin your fitness regimen. You may even gain weight as you build more muscle than fat. Then there’s the issue of water retention – a particular challenge for us women, especially during our cycle. This alone can make our weight fluctuate anywhere from 3 – 5 pounds. Discouraging if you’re weighing yourself regularly, right? There are plenty of better alternatives to measuring your progress against your fitness or weight loss goals. BMI or Body Fat Test – Most gyms will offer fitness tests to their members on an annual basis for a nominal fee – often even for free. This is a great way to measure your progress over time looking at the change in body fat percentage. How Your Clothes Fit – I don’t know about you, but the first way I can tell that my fitness regimen is working is by how my clothes fit. They start to feel loose and look more flattering. You can even use a pair of jeans that don’t fit to help you measure your progress. Visual Inspection – As I progress with my fitness plan, I often start to literally see my body looking tighter and more defined. It’s gradual, but oh so satisfying… Taking pictures throughout your progress is also a helpful way to see how your body is transforming. How do you measure your progress against your fitness goals?